Ski condos and vacation rentals directly from the owner on VRBO. Find the best current deals for ski inns and condos and book online to save. NC Ski Resorts offer the highest mountains east of the Rockies and the most convenient location for Floridians to ski slopes. Whether you're a beginner or advanced skier, snowboarder, snow tuber or ice skater the North Carolina Mountains have a ski area you will enjoy. Check-out NC snow reports and links to the ski slope webcams. 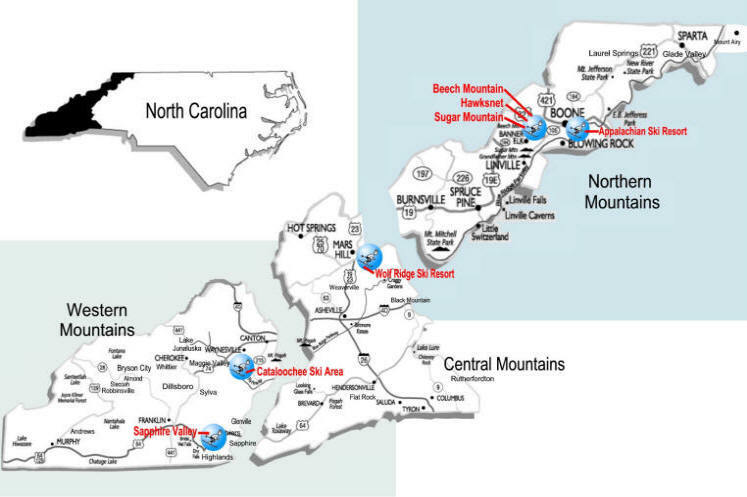 NC Ski Resorts and Areas include: Appalachian Ski Resort, Beech Mountain Ski Resort, Cataloochee Ski Area, Sapphire Valley Resort, Sugar Mountain Ski Resort and Wolf Ridge Ski Resort. When the world was created, North Carolina's Appalachian Mountains received many special gifts.They are the highest mountains east of the Rockies with temperatures cold enough for snowmaking, incredible scenery...and some of the friendliest folks in the world. There's something here for everyone. Beginner skiers, advanced skiers, snowboarders, snow tubers, and ice skaters can all enjoy a mountain experience. GET A GOLD CARD for an annual pass to 6 ski resorts- visit the site for details. Wolf Ridge Ski Resort is north of Asheville in the outskirts of Mars Hill NC. The Slopes of Wolf Ridge have over 82 acres of ski terrain with 23 Exciting Ski Slopes, 10 Green Family Runs, 3 Black Diamond and 10 Blue Runs . There are 2 Quad Lifts: 2 Double Lifts: 4 Surface Lifts . Two Ski Lodges offer ski/snow board/bibs/helmet/locker rentals, full food service, gift/sport shops and fireside dining and relaxing. Slope side cabin and vacation rentals are available. There is something for everyone from beginner to expert at this family-oriented resort. Hawksnest is located at Seven Devils near Banner Elk NC and recognized as the largest Snow Tubing Park on the East Coast. The 20 Lane Snow Tubing Park has four different areas to snow tube with lanes 400 to 1000 feet long. Two conveyor lifts take snow tubers back to the top for more rides. Hawksnest has 100% snow making and lighting on all lanes to provide the best possible conditions and fun for the whole family. Tube World is a 5 run snow tube park in Maggie Valley NC popular with locals and visitors alike. Sit back and enjoy the moving carpet lift to the top and then get ready for the slide of your life. The Wee Bowl Snowplay Area is for those who do not meet height requirements. Tubing is on a first come, first served basis. Conveniently located across from the Ski Lift on Highway 19. Find lodging, restaurants and attractions convenient to Cataloochee at Maggie Valley NC, Waynesville NC and Lake Junaluska NC. Jonas Ridge Tubing Park is located in the High Country in between Linville and Banner Elk. Gravity does its thing, zipping you down the runs leaving you gasping for air. Night time lights for night tubing and snow guns if mother nature need help making snow. Scaly Mountain Snow Tubing is south of Highlands NC. The Scaly Mountain Outdoor Center is the place to enjoy both summer and winter fun with Trout Fishing, ice skating, summer tubing, snow Tubing in the winter and a driving range. Scaly Mountain Outdoor Center is fun for the entire family, young and old alike. Come for a school field trip, company fishing party, church group activity, birthday party, family reunion, or just for a fun getaway. Moonshine Mountain is located at 5865 Willow Road, Hendersonville NC. Moonshine Mountain Snow Tubing & Indian Mining Adventure Park offers over 500 feet of fun & excitement for all ages and is the only Snow Tubing Park in the Southeast that allows trains. New last year is HALF HILL TUBING, a lane designed especially for the little people. There are 3 separate lanes plus a short lane for the little folks and a natural run out which makes Moonshine Mountain one of the safest around!